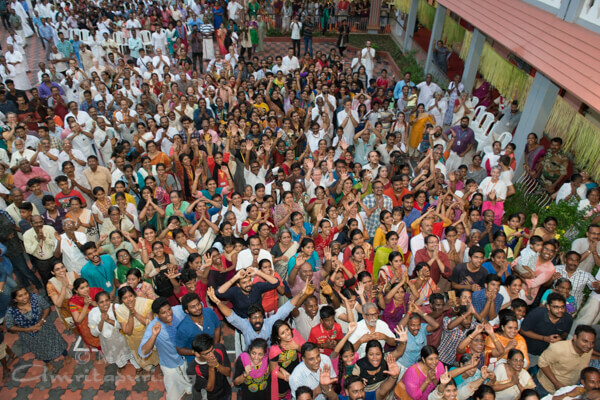 The Vishu celebration was carried out with great enthusiasm all around the ashram. 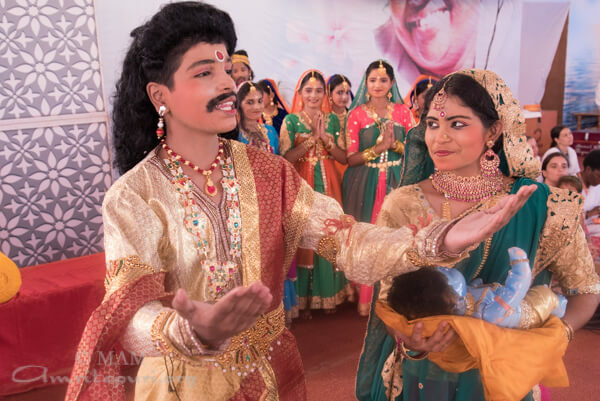 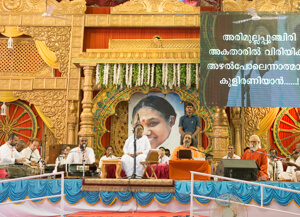 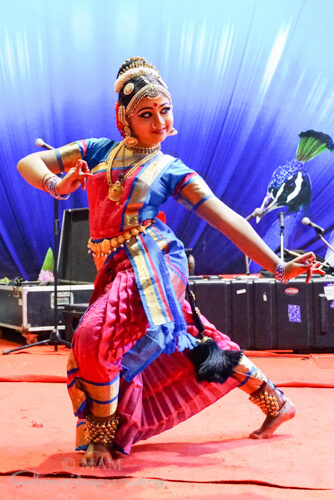 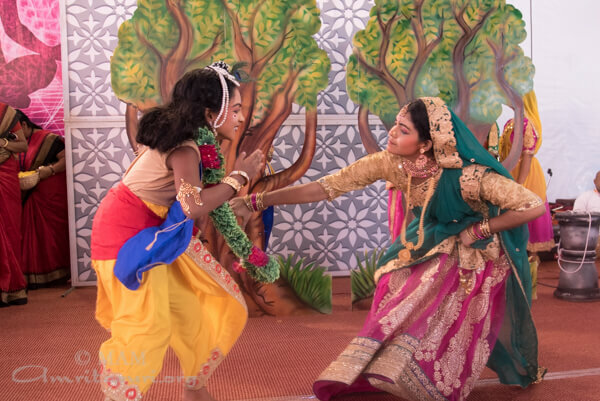 There were separate Vishukkani* arranged in the Kalari, near Amma’s house, and on the stage of the bhajan’s hall. 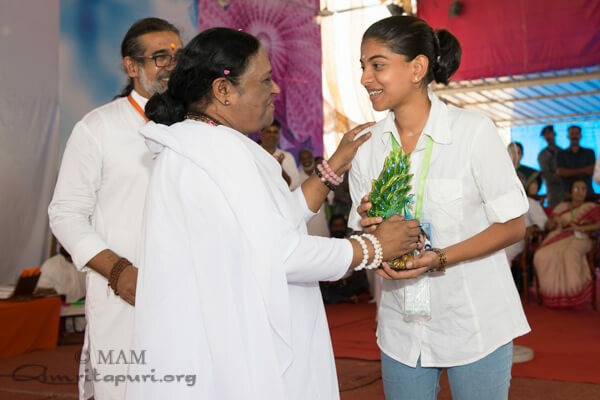 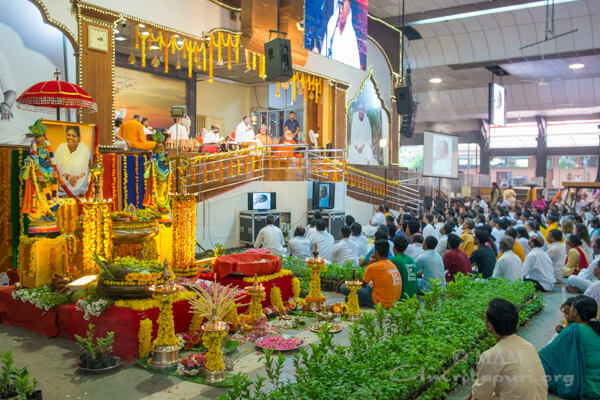 Along with Vishukkani, saplings and plant seeds were also kept on the altar. 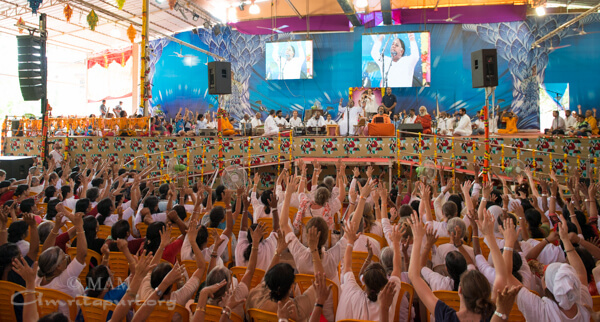 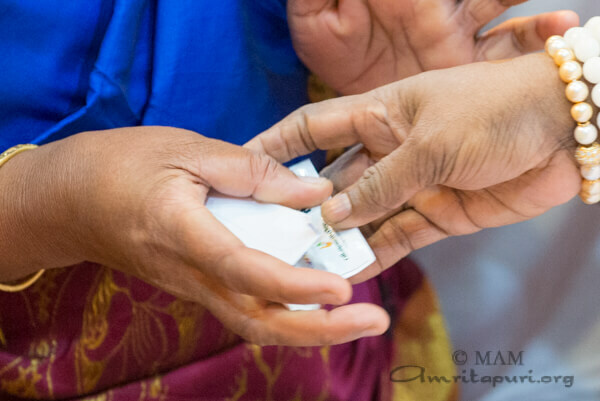 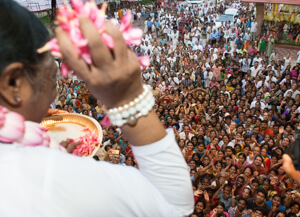 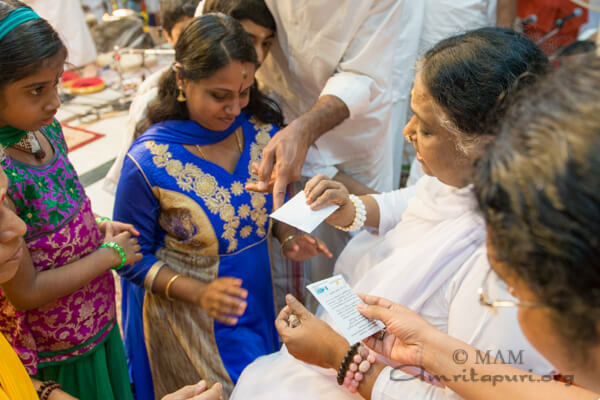 Each devotee who came for darshan received a packet of seeds along with the typical Prasad. 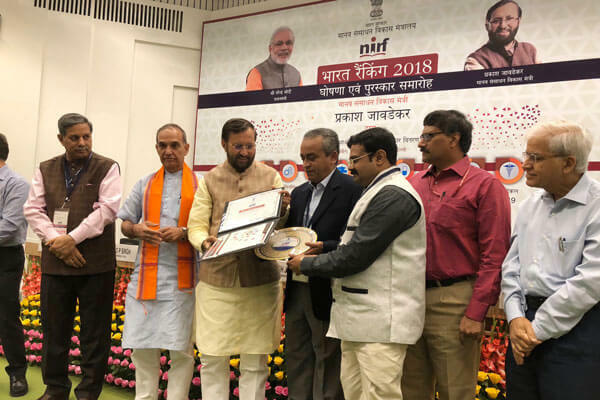 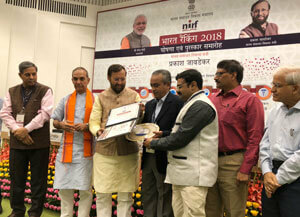 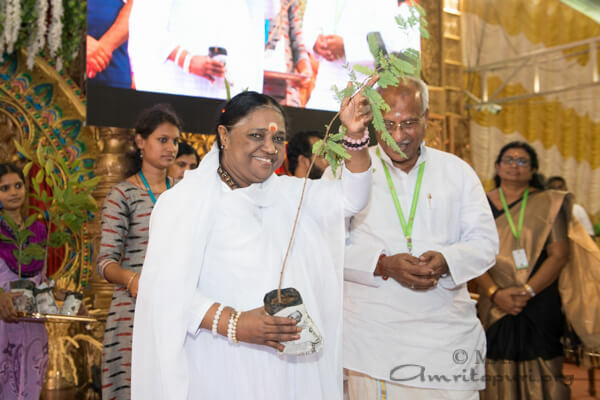 Devotees also received blessed saplings, along with a rupee coin, which serves as a Vishukkai neettam** on the holiday. 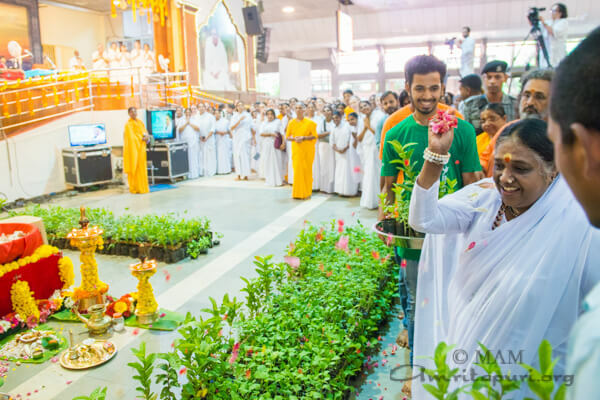 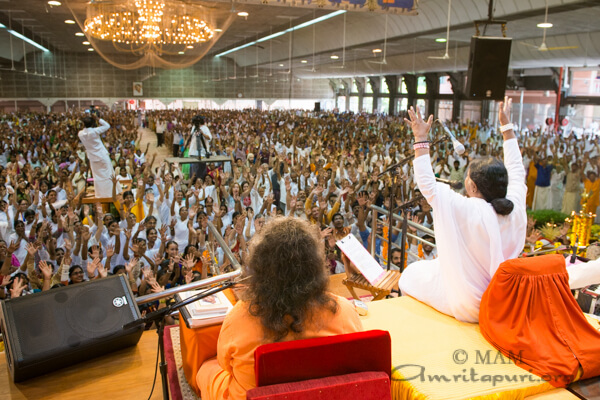 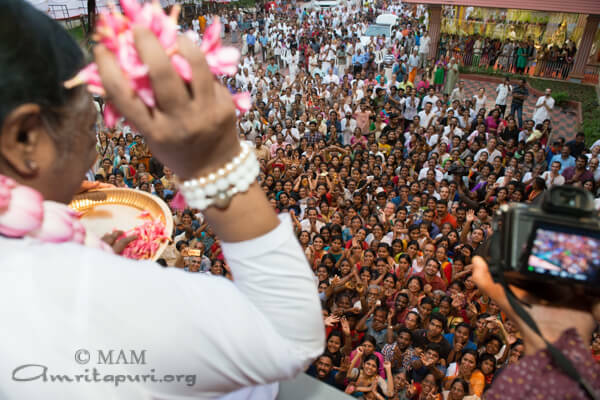 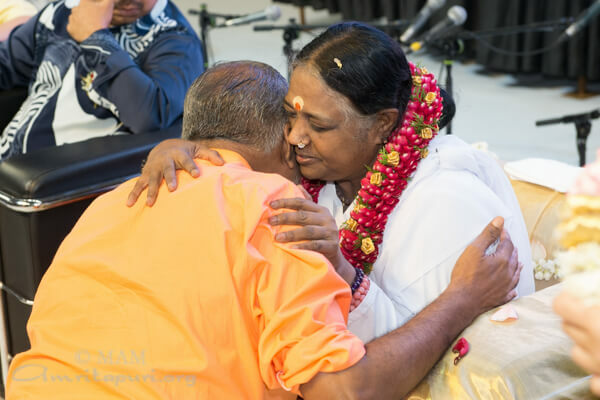 Prior to Darshan, Amma sang a set of Krishna bhajans, and addressed the audience, saying: “Like the cheerful blooms of the golden April laburnums (Konna), Vishu is a celebration that fills our hearts with joy. 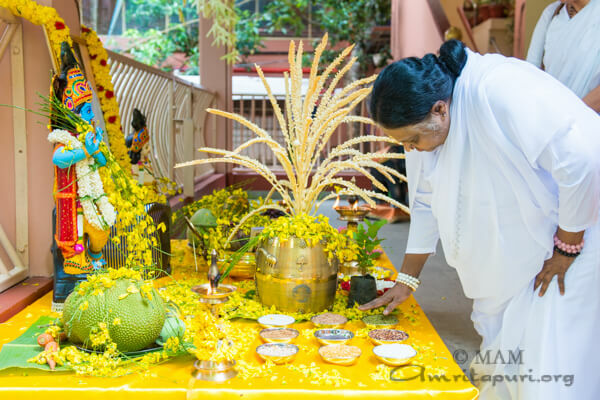 Vishu is a symbol of prosperity and abundance. 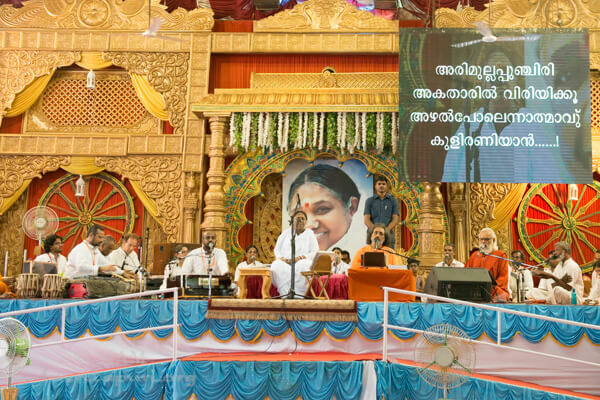 Vishu brings us the message of an ancient agrarian culture that existed in harmony with nature. 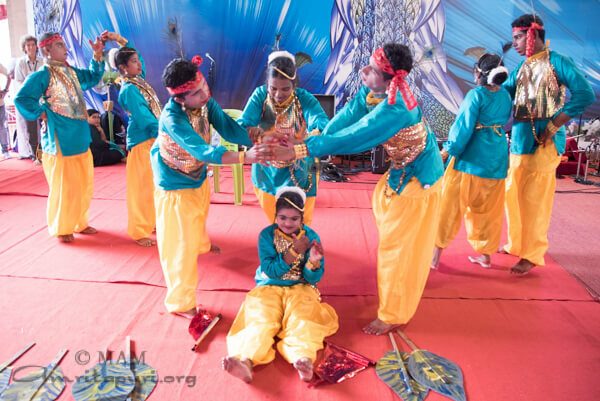 Over and above that, Vishu also brings us the message of devotion, surrender to God, and equal vision. 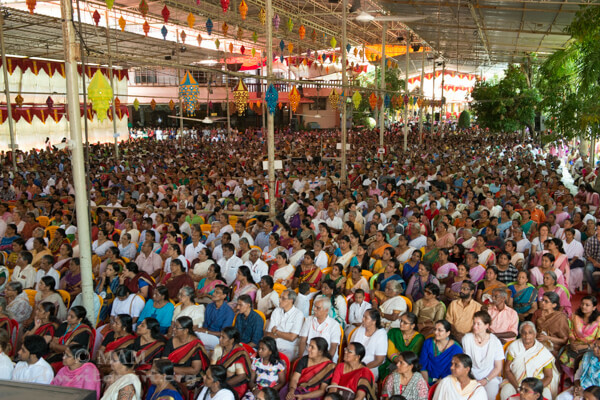 “We start the Vishu day thinking of God. 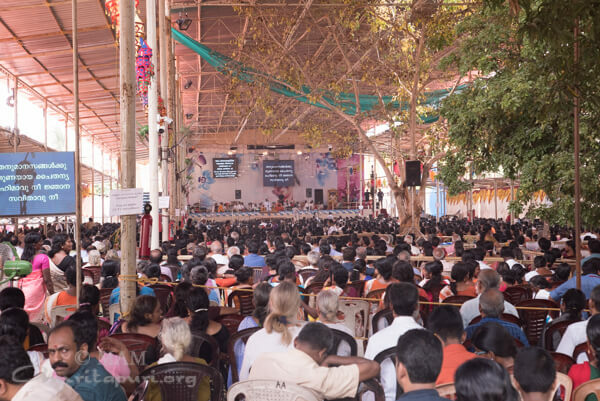 The message here is that every day should begin with the remembrance of God. 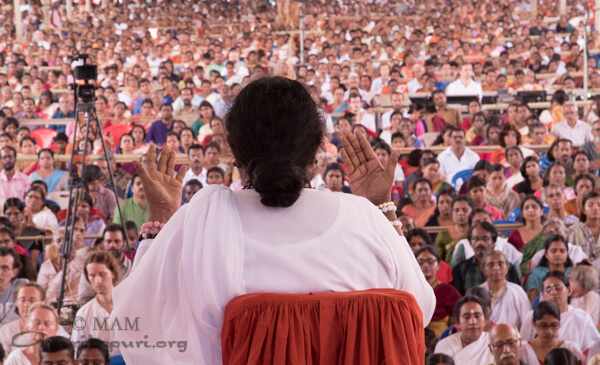 When we begin a day with a positive thought its motivation remains with us throughout the day. 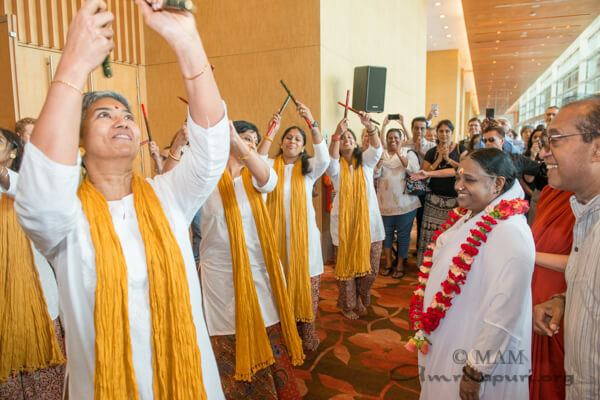 This is why the image of God should reflect internally in our mental mirror as the first thought of the day. 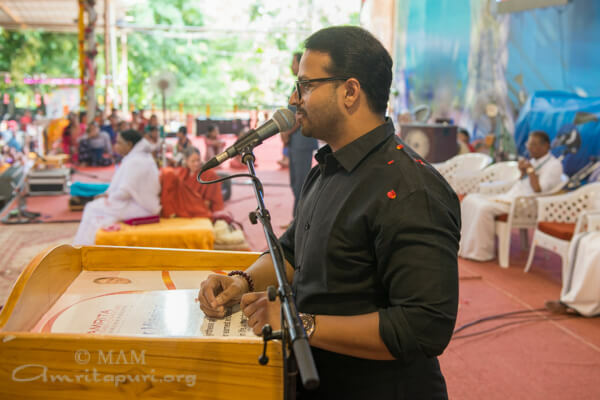 Keeping a mirror as part of the Vishu kani symbolizes our effort to look within and wipe away the blemishes from our mind. 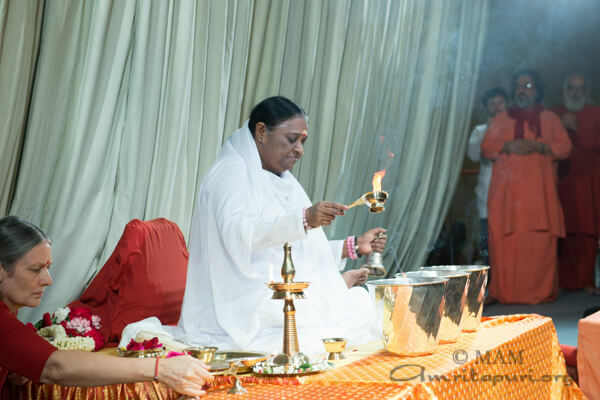 Awakening the remembrance of God within is also to clean our mind of its impurities. 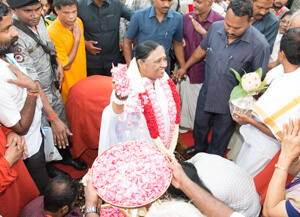 Devotees were also served a feast replete with payasam. 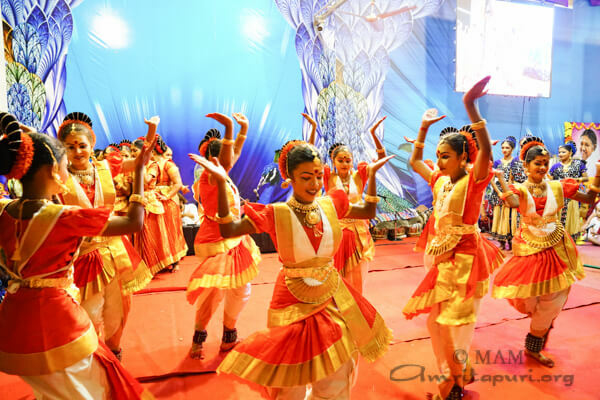 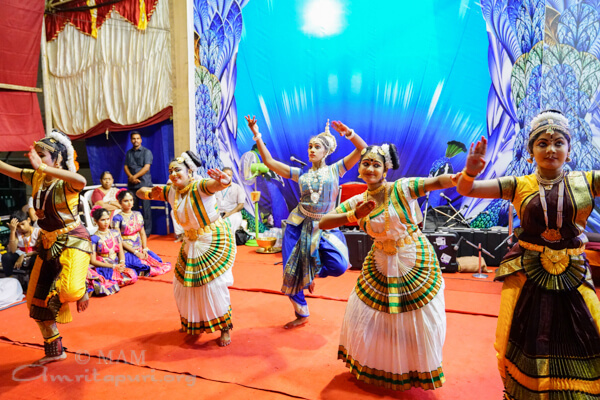 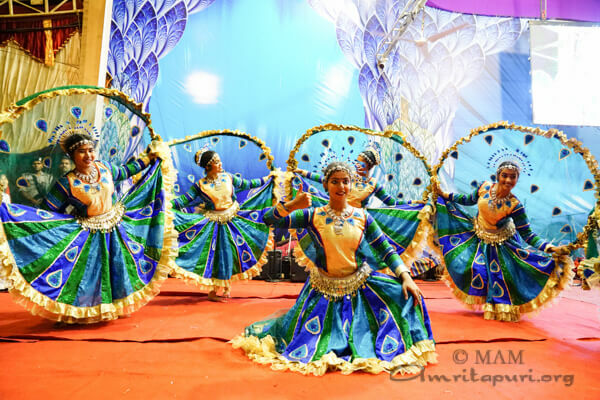 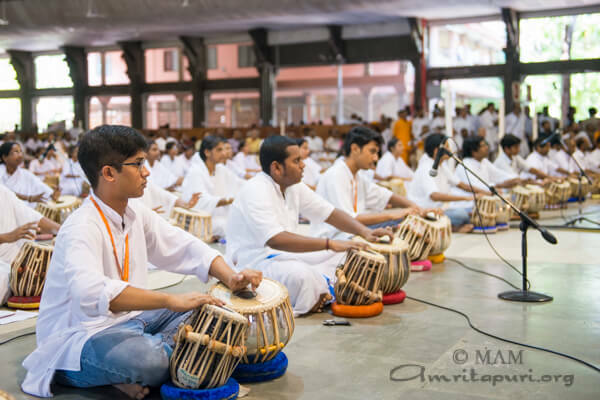 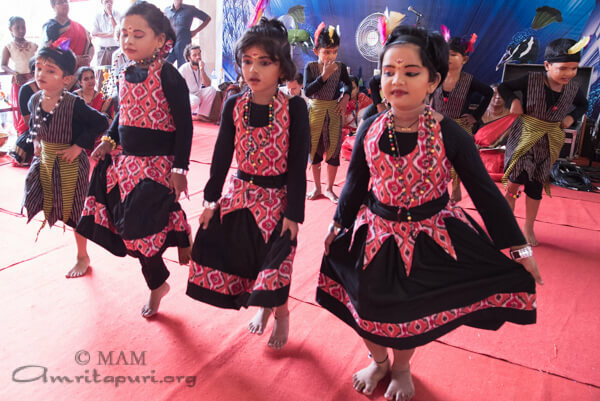 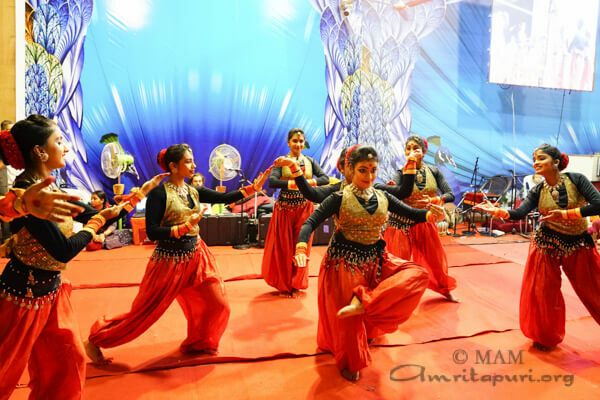 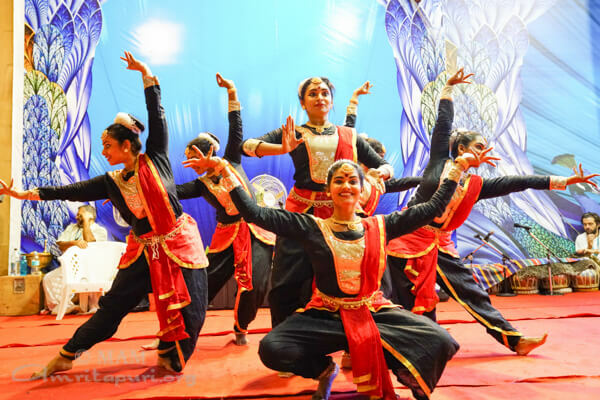 Ashram residents presented tabla performances and dance programs as part of the celebrations. 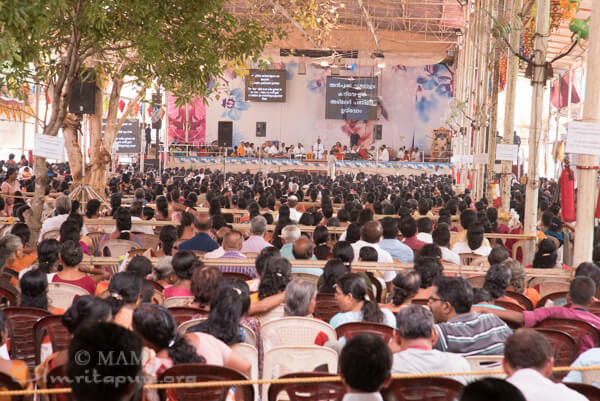 * Vishukkani – meaning that which is seen first on the day of Vishu. 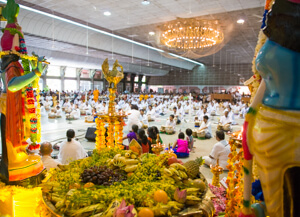 The altar is arranged with a statute Lord Krishna along with the yellow Cucumber, Mangoes, Jackfruits, all available vegetables, halved coconuts with oil lamp inside, and ‘Konna’ flowers. 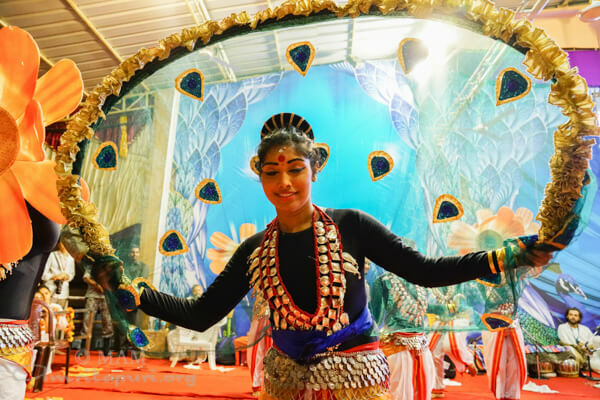 A starched ironed cloth made into a hand fan, kept inside ‘Kindi’, is decorated with gold ornaments, and a mirror is also kept in the front of as part of the arrangements. 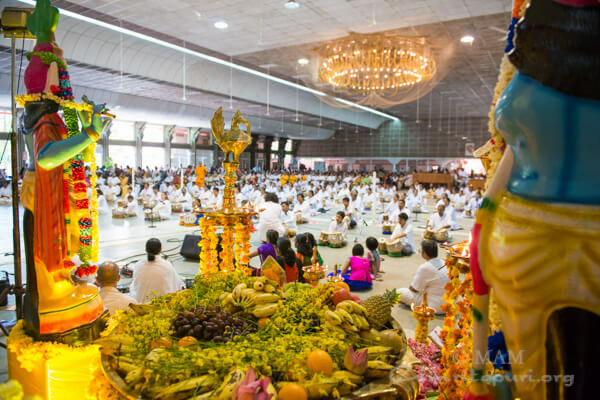 All these are kept in a ‘uruli’ (a brass vessel) which is filled with polished rice. 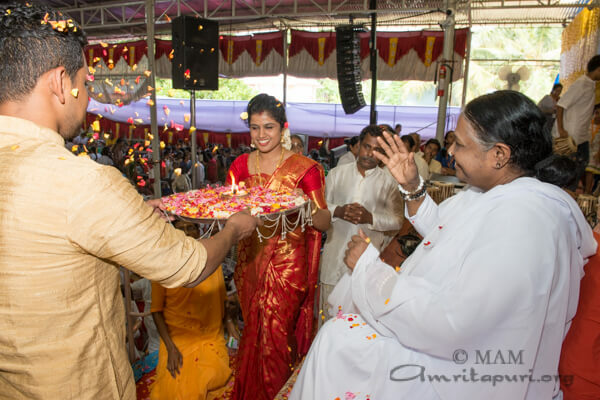 ** Vishukkai neettam – the elders in the family have to gift all the younger members with money, usually in the form of newly minted coins. 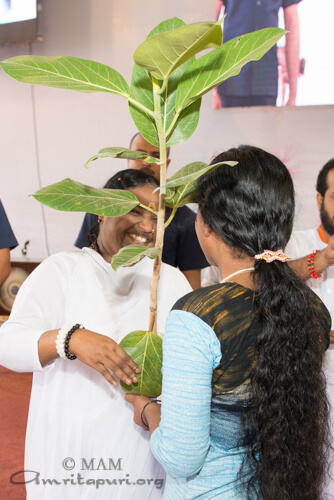 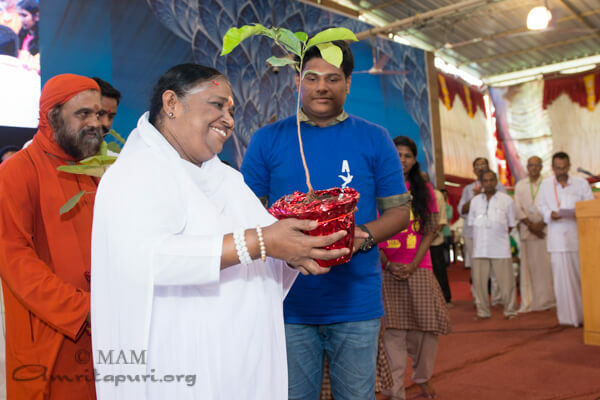 Here Amma has introduced a sapling along with it, encouraging the younger generations to care for nature, calling it – Vishuthai neettam. 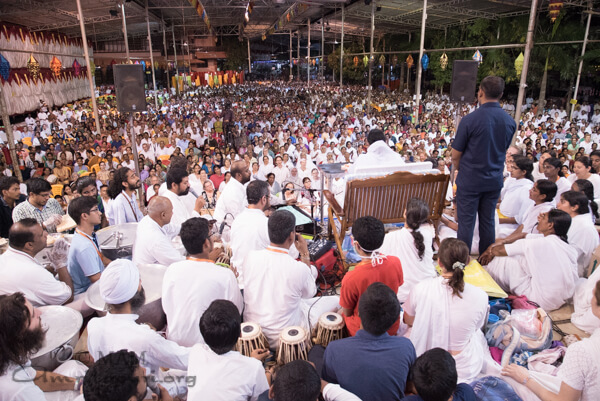 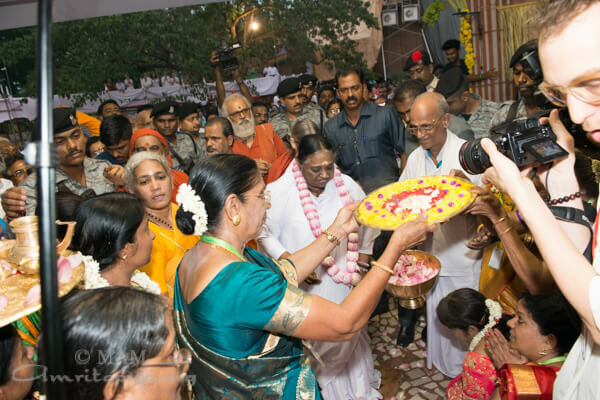 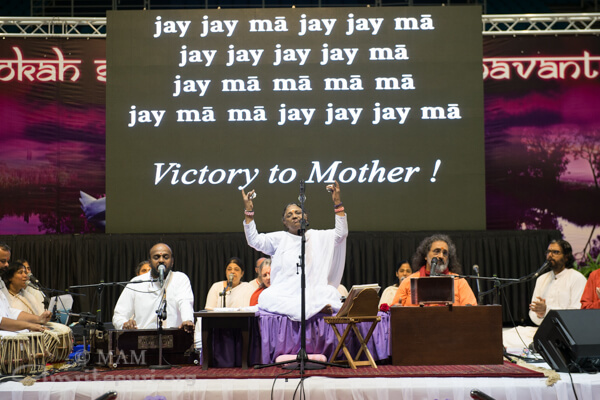 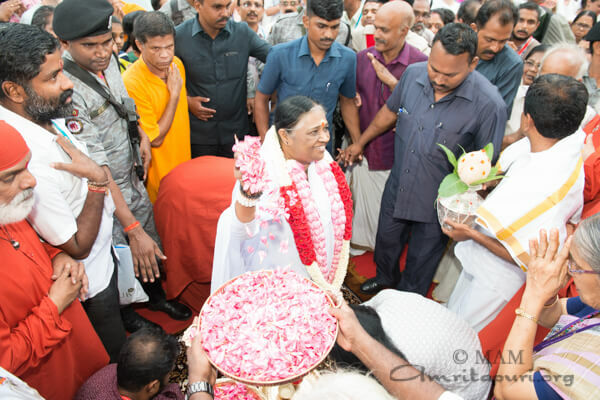 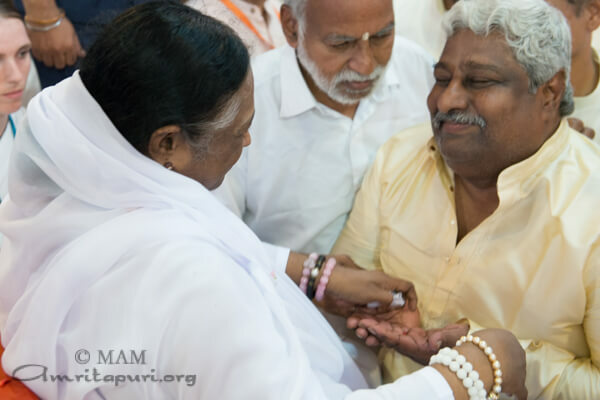 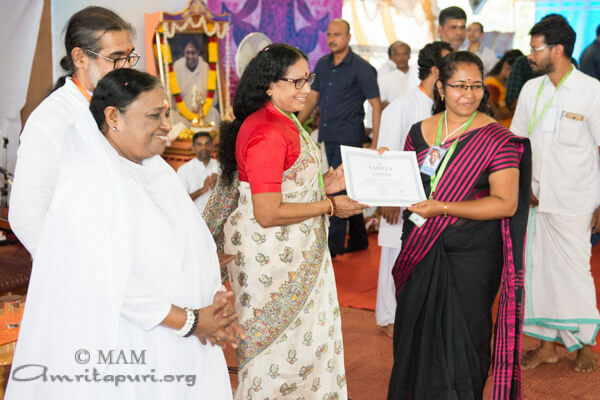 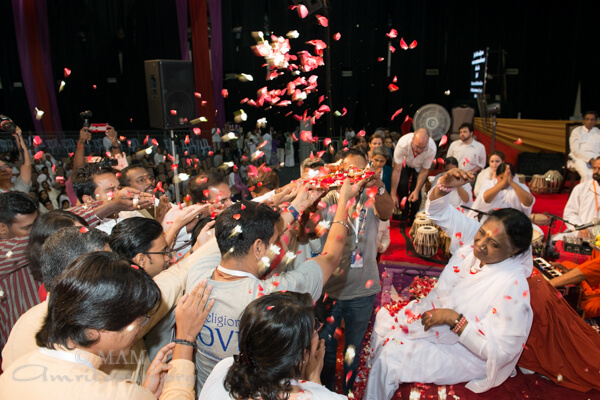 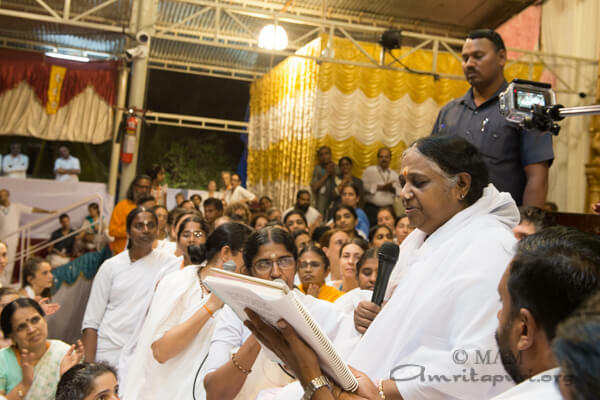 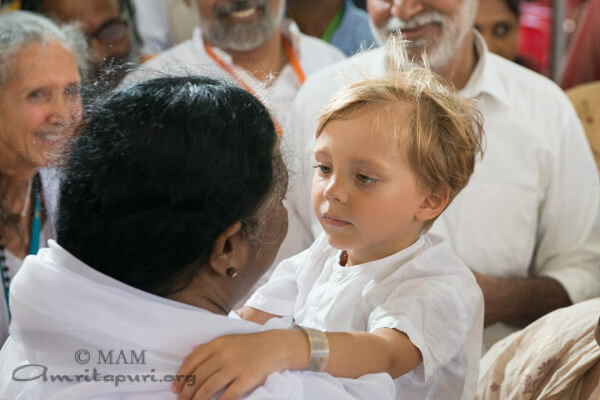 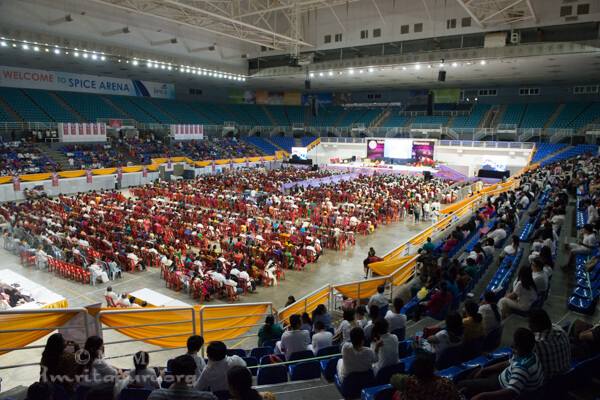 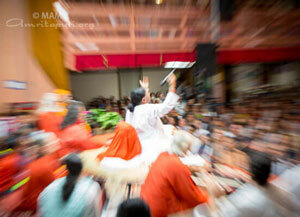 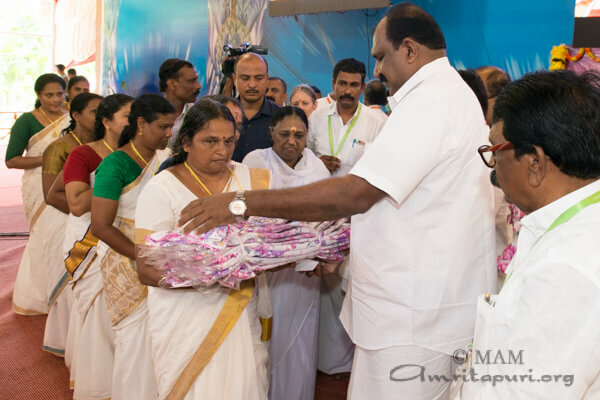 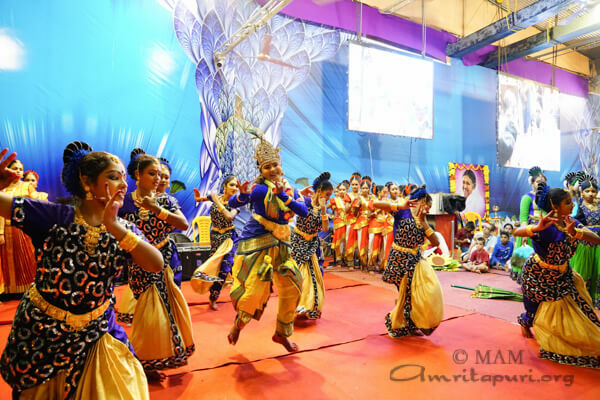 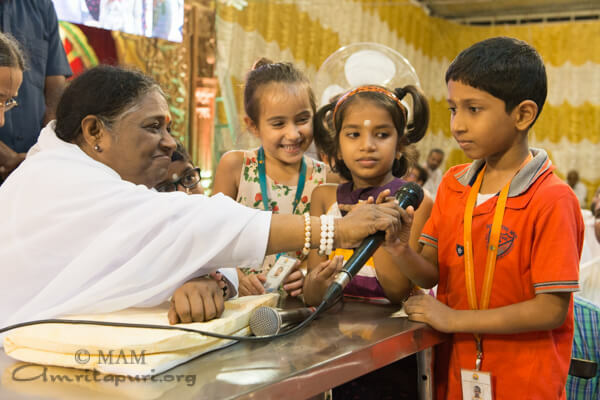 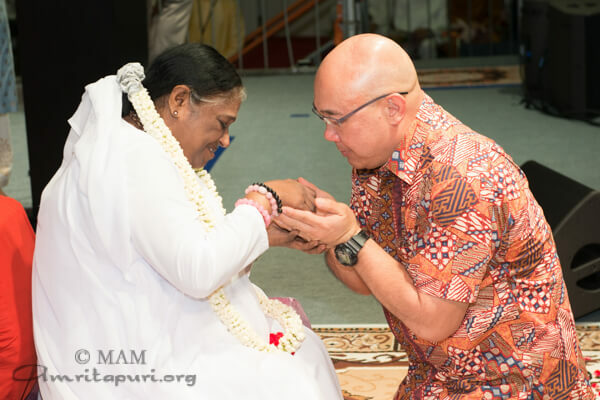 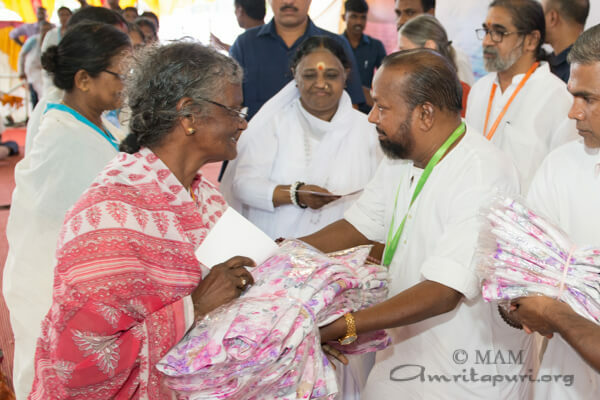 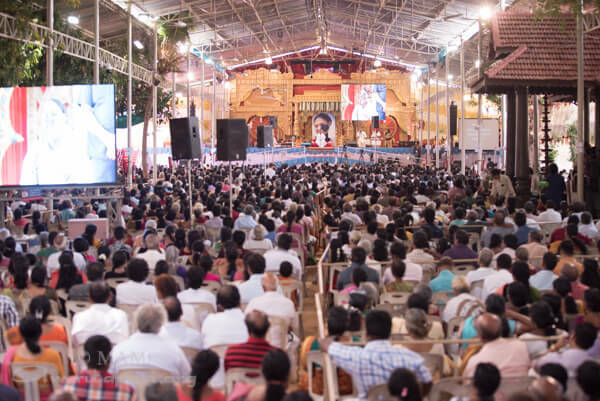 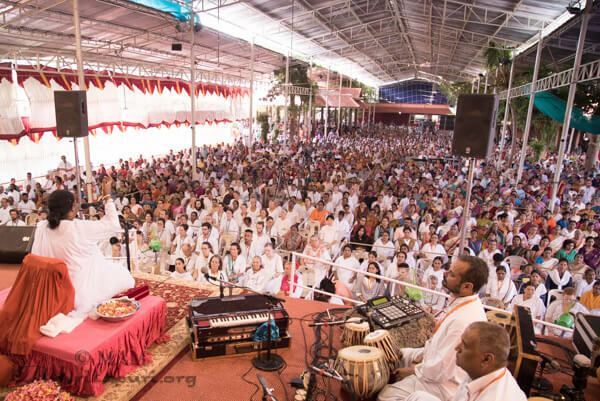 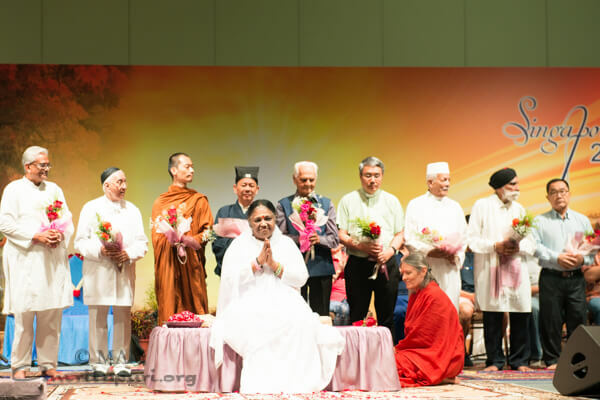 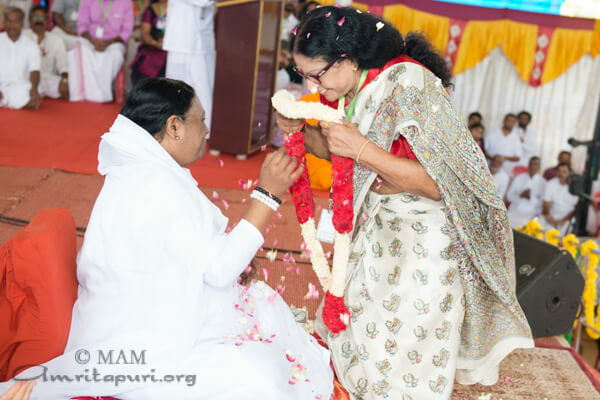 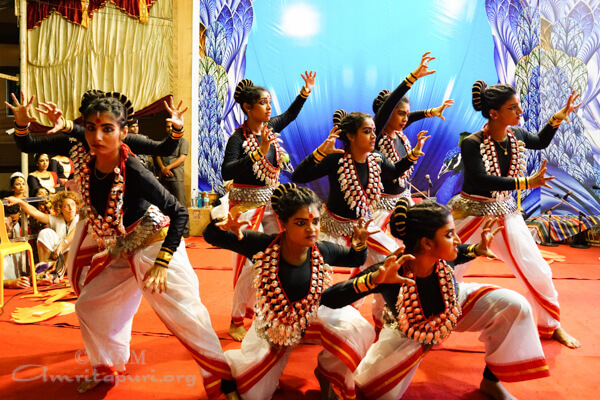 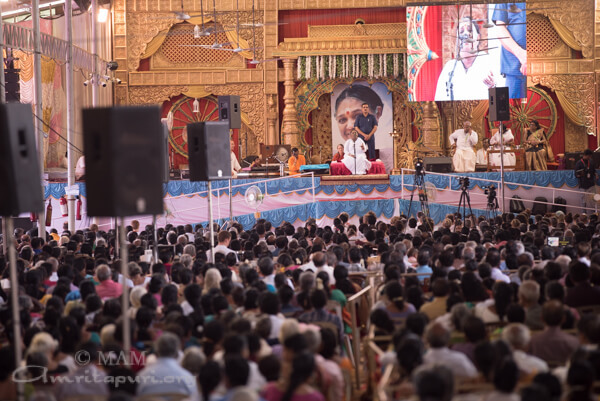 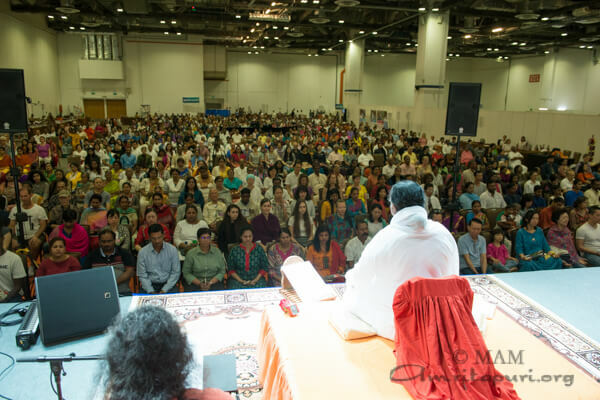 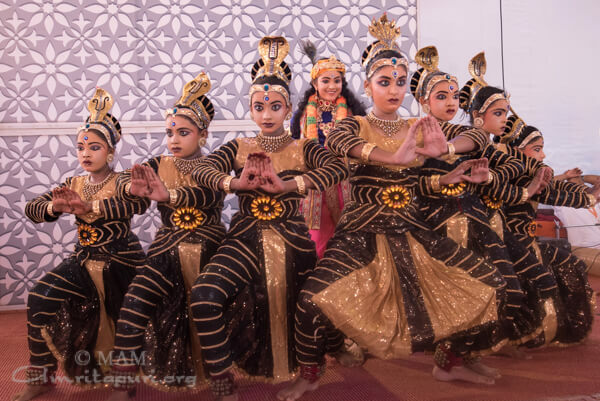 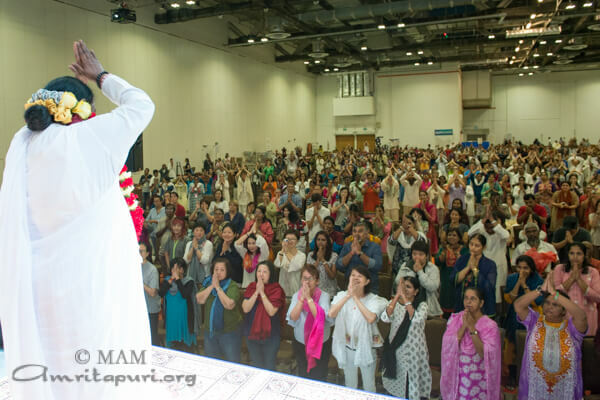 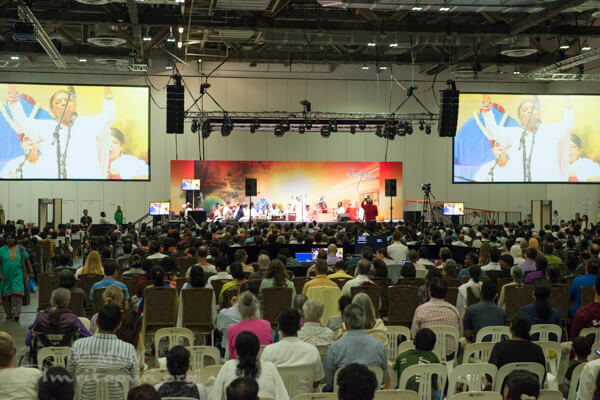 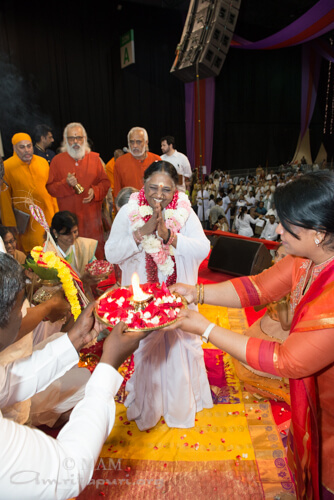 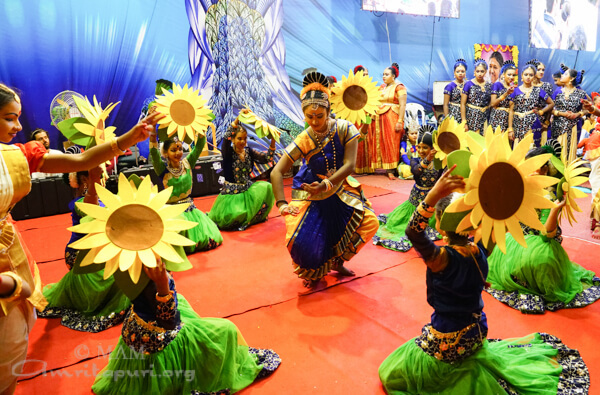 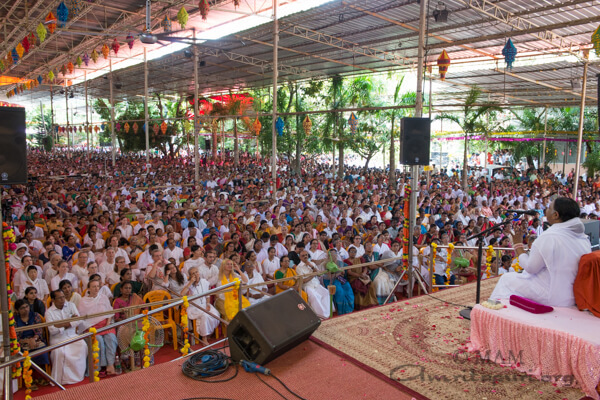 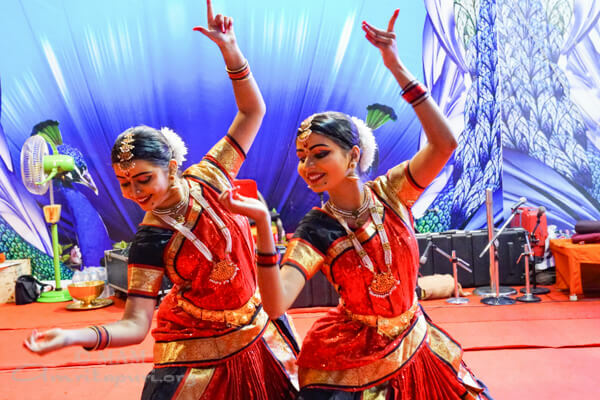 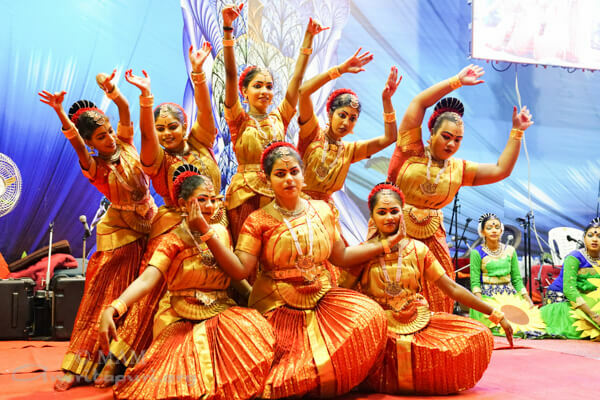 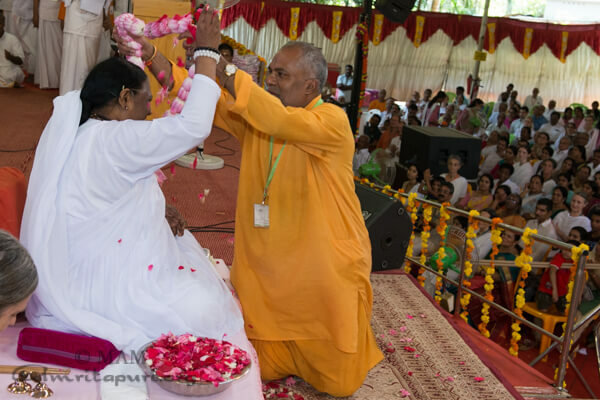 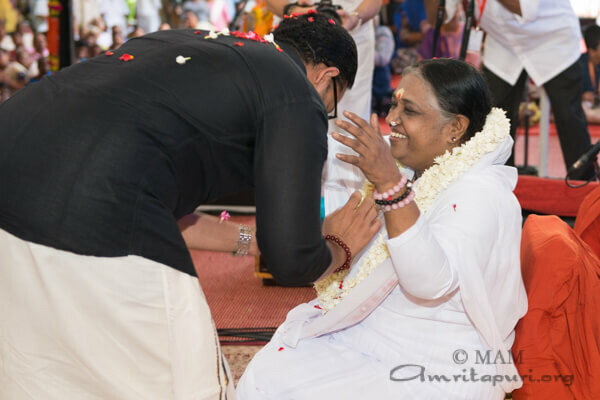 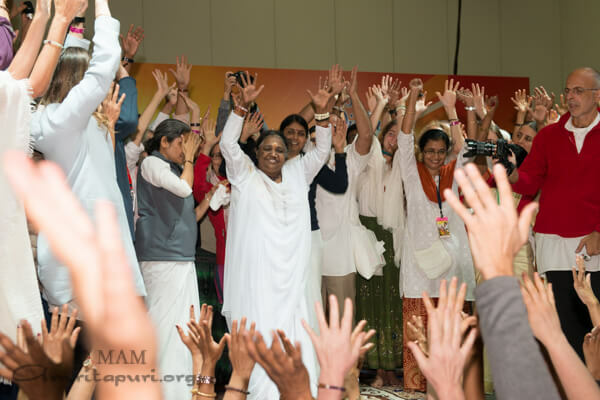 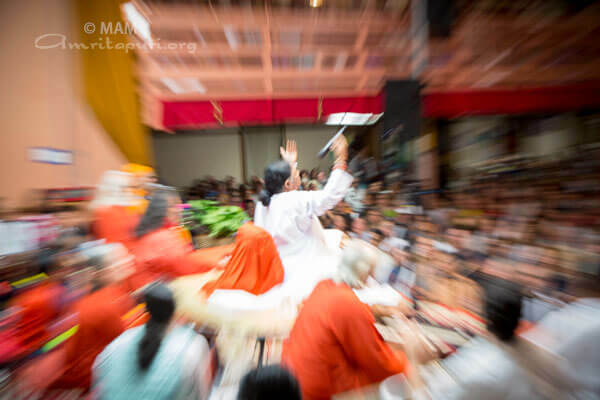 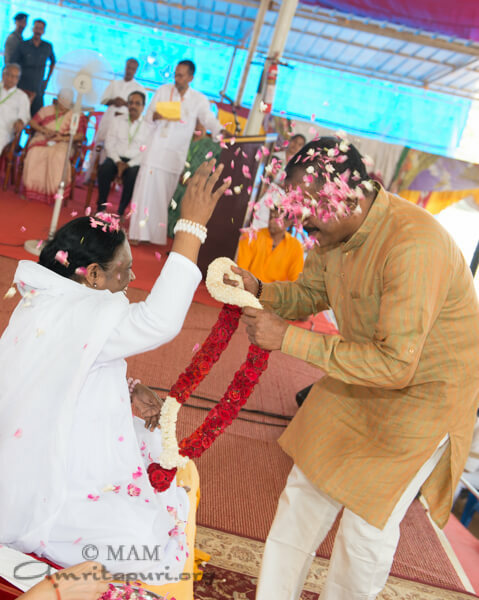 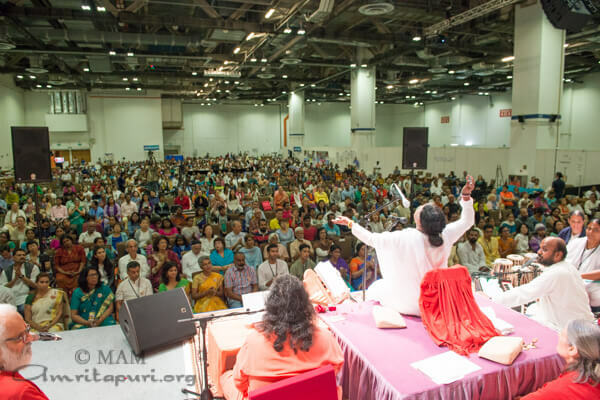 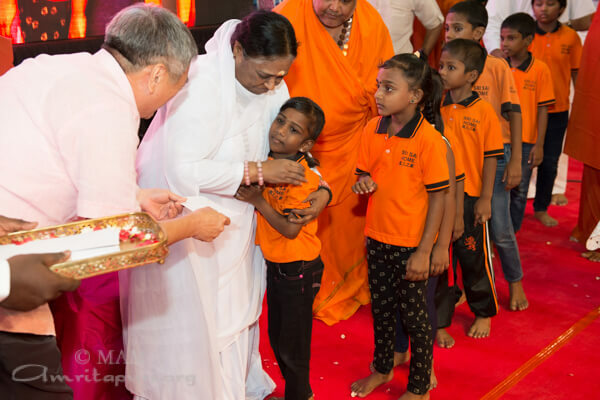 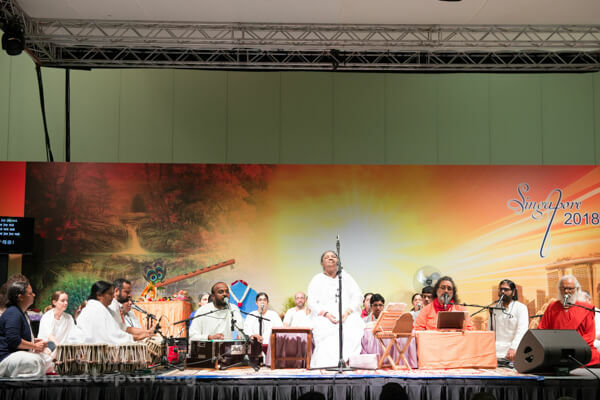 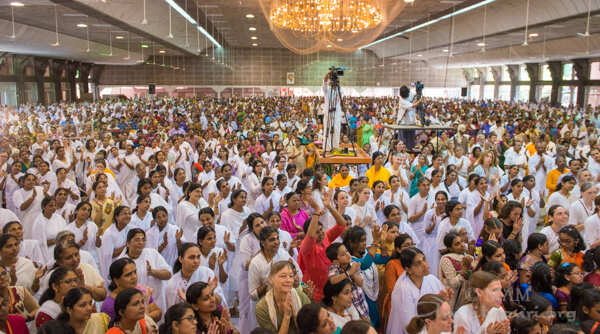 Amma’s programs were a resounding success with venues overflowing with devotees and admirers in Kuala Lumpur, Penang and Singapore. 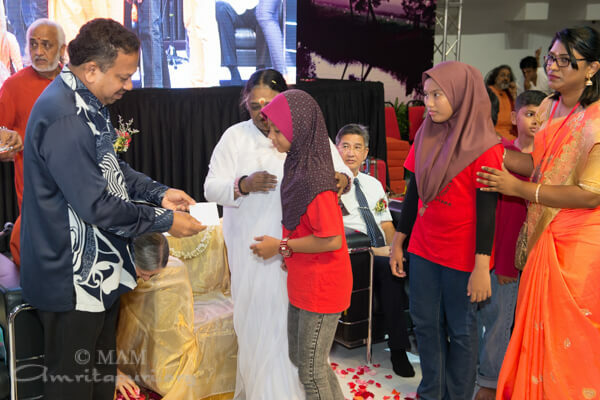 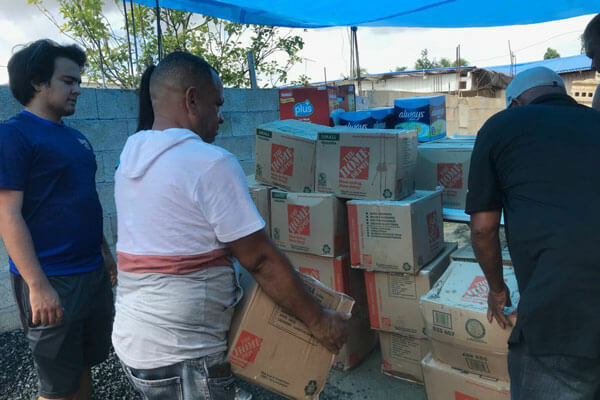 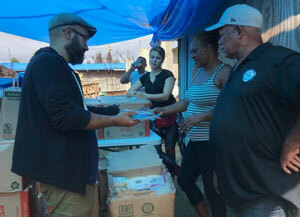 Highlights of the weeklong journey included new and expanded charitable initiatives being rolled out at programs in all three places, including educational scholarships for young students suffering from cancer in Malaysia; an additional 100 scholarships for underprivileged students in Singapore; construction of a water catchment pool to provide clean drinking water for the indigenous people (locally known as ‘Orang Asli’) living in the village of Sekam, located on the way up to the Cameron Highlands Malaysia; and distribution of hundreds of sarees to underprivileged women from remote villages in Peninsular Malaysia. 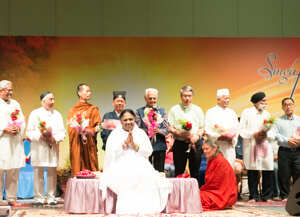 The programmes in both Penang and Singapore featured an interfaith tableau of special guests upon the dais with Amma; in Singapore, the interfaith representatives included Sneh Kant Gupta, Hinduism; Ervad Rustom M Ghadiali, Zoroastrianism; Phra Chun Kiang Goh, Buddhism; Teo Chai Ngo, Taoism; Jayantilal Amarshi Govindji, Jainism; Martin Yee Yeow Wai; Christianity; Aladad Khan Mulladad, Islam; Harbans Singh, Sikhism; and Chu Kin Mun Daniel of the Bahá’í Faith. 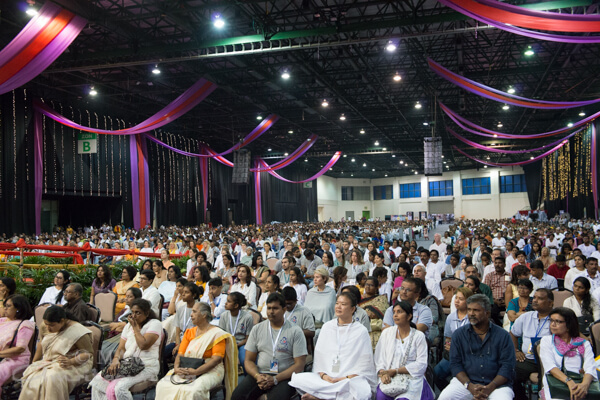 The interfaith assembly participated with Amma in a silent prayer for world pace. 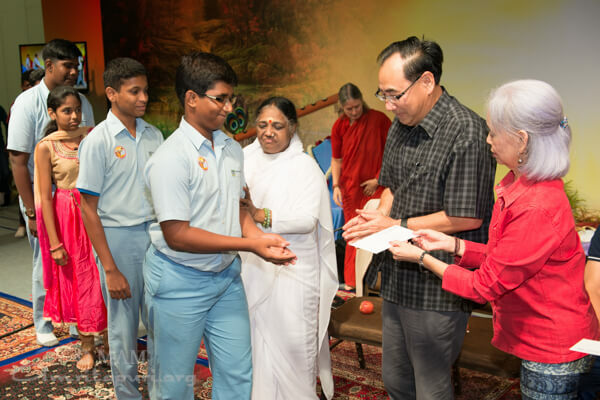 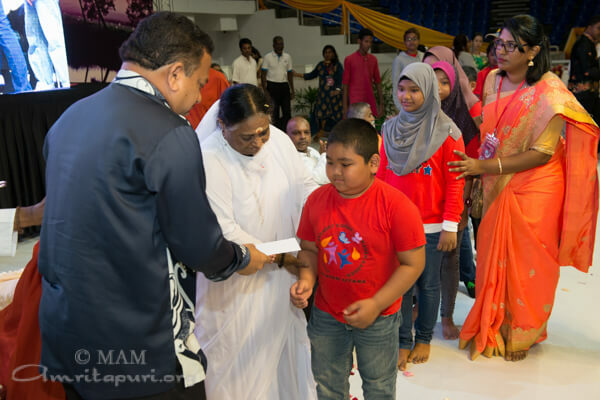 The local chapter of AYUDH Penang was also launched on the occasion of Amma’s visit. 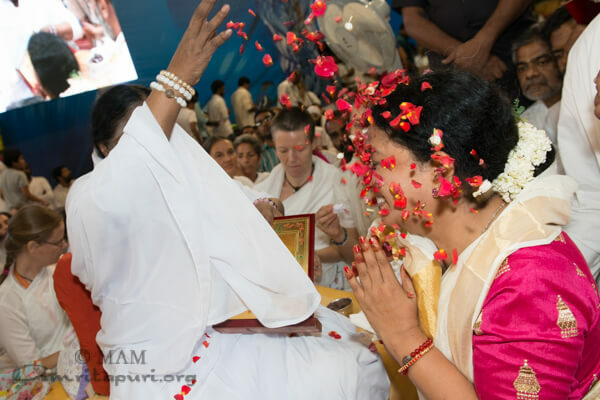 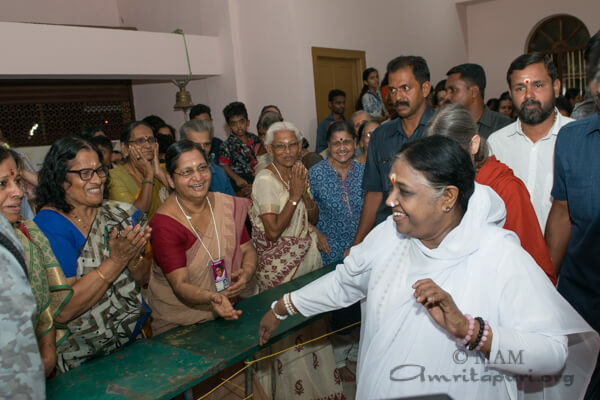 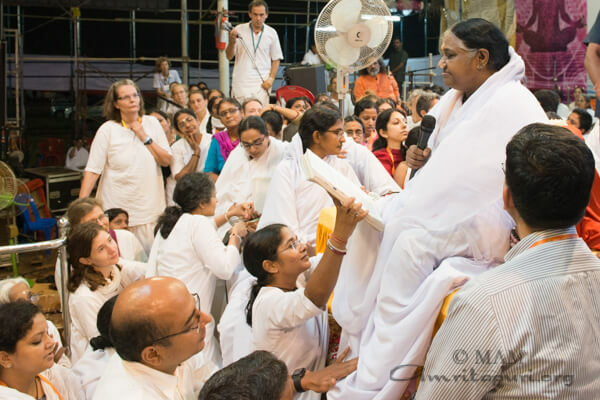 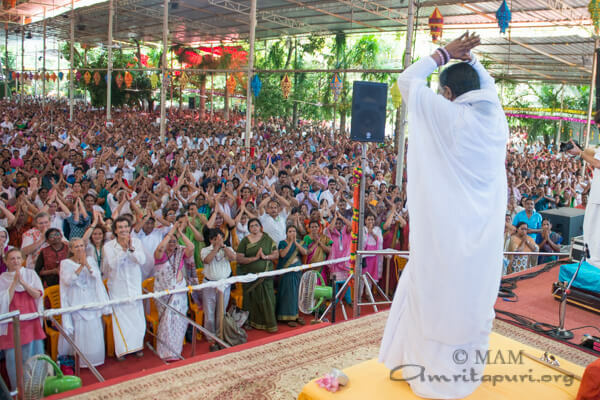 Amma to visit Japan, USA and Canada from 29th May to 12th July. 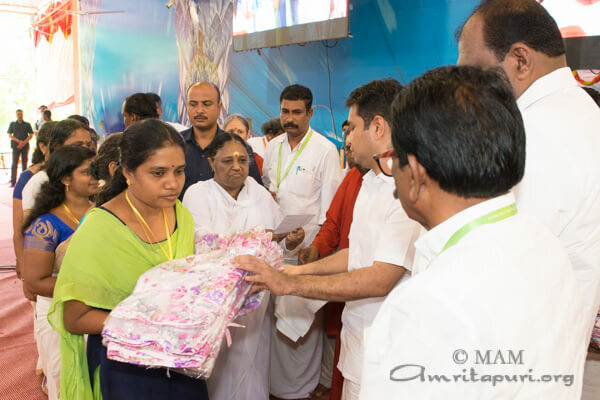 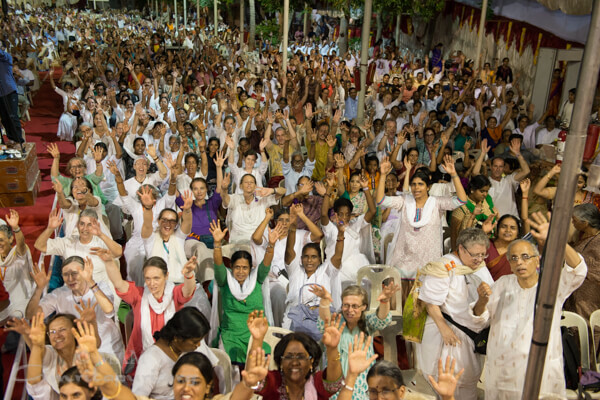 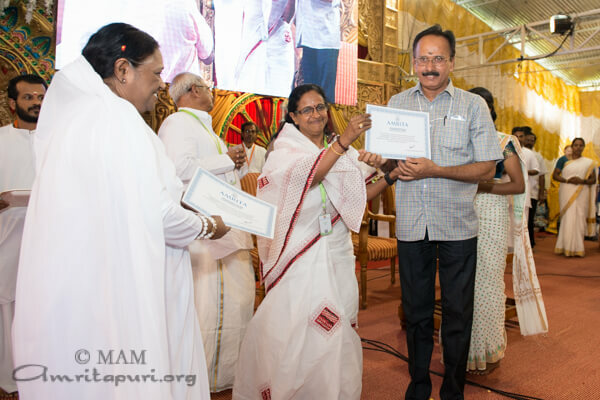 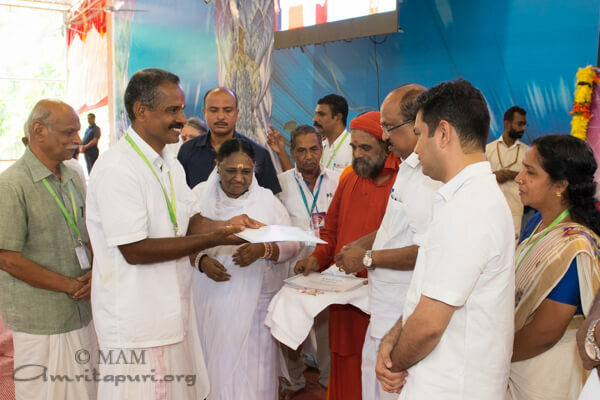 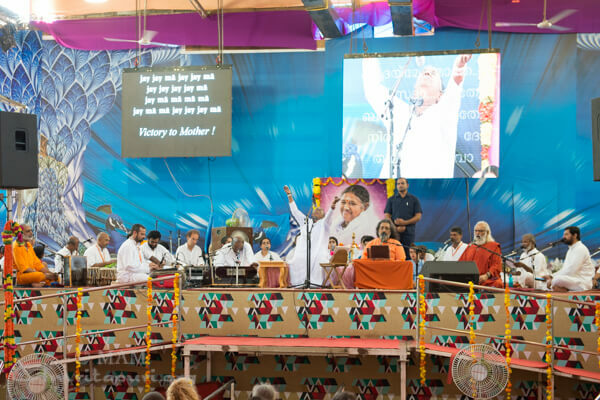 Amma will hold programs in these cities which contains Satsangs, Guided meditation sessions, Bhajans and Darshan. 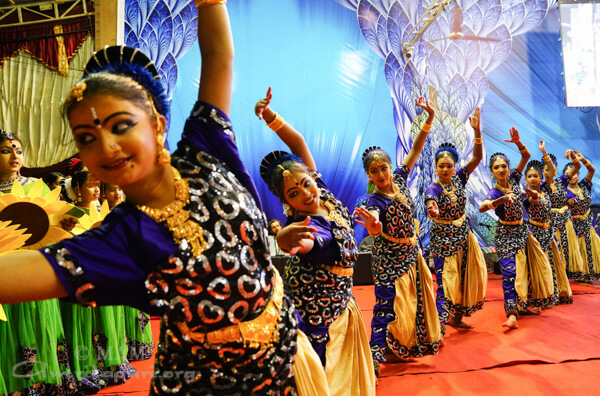 Venue: Hilton Bellevue, 300 112th Avenue SE Bellevue, Washington 98004. 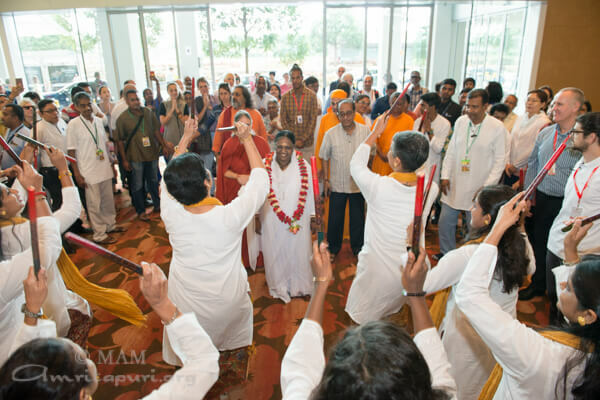 Venue: MA Center, 10200 Crow Canyon Rd. 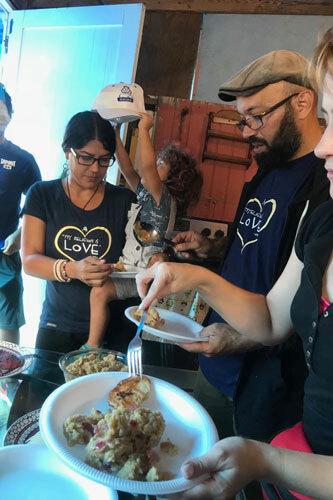 Santa Fe, New Mexico 87506. 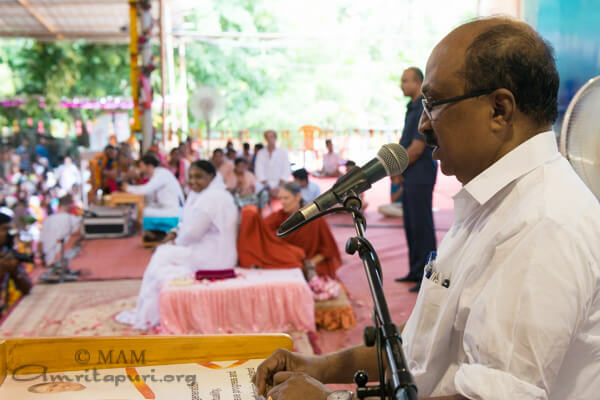 Retreat: July 9th – 11th. 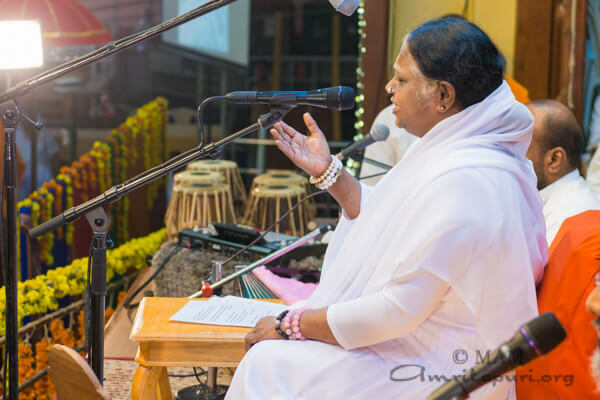 655 Dixon Road, Toronto, Ontario M9W 1J3.